Why should your business choose Kapuli? Kapuli Business Park is just a stone’s throw away from the Mäntsälä center, and only 45 minutes from Helsinki-Vantaa International Airport by road. Our energy company, Nivos, helps you with the energy and broadband related matters. Cool climate and reusable excess heat helps in keeping the data center costs down. Excess heat from cooling is transmitted for heating houses in Mäntsälä. Mr. Harri Kari, the CEO of Invest In Mäntsälä, speaks about Kapuli Business park in Mäntsälä. What kind of advantages Mäntsälä Kapuli Business park's location will offer to your company? Kapuli Business Park enjoys electric power supplies of first-rate dependability, with sufficient capacity ensured through the connection of Nivos Oy (local energy company) at two key points in the Finnish national grid. This means that the Business Park can draw a guaranteed 1-50 MW of electrical power from three electricity stations through either of two power lines. 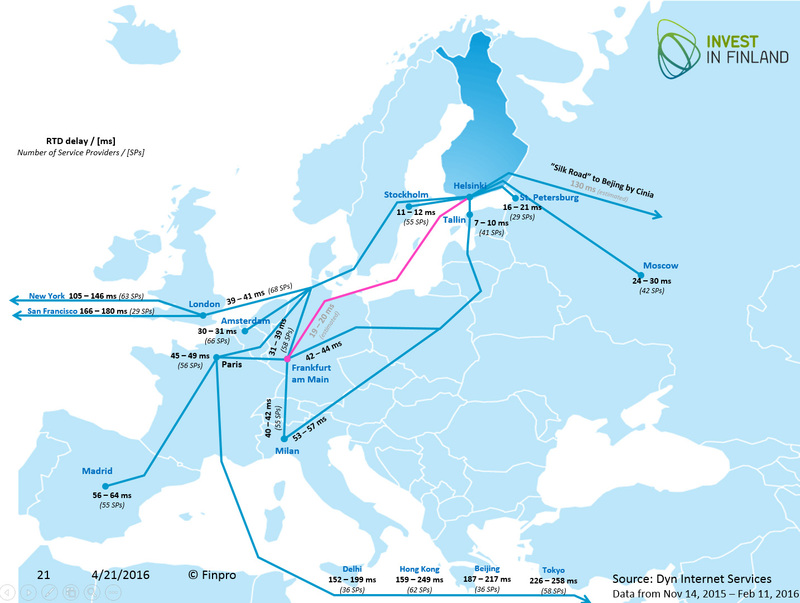 In Finland, you can seek best bids for the electricity. Nivos has begun designing a new, third 110 kV power transmission line directly from the Hikiä generating plant to the substation at Kapuli Business Park. The new line will further improve the dependability of electric power supplies to data centers in the Kapuli area. It is estimated that the new transmission line will be completed in 2017, whereupon Kapuli will be served by three independent 110 kV power cables from two (three) separate connection points on the national grid. 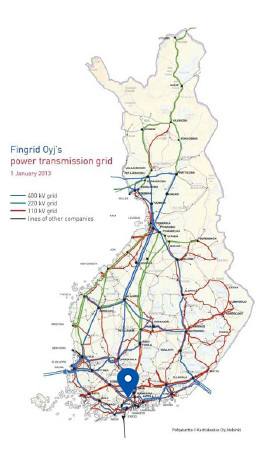 The construction work will also duplicate the outgoing transmission line connection at Hikiä to supply two separate substations. Each of the three 110 kV transmission lines will be capable of supplying about 150 MW of electric power to Mäntsälä. There will be no minimum connection limit for the Nivos 110 kV regional network, so a new operating point beginning at low peak power may be connected to the regional network by bilateral agreement. This will give you flexibility in timing investments, and the freedom to develop your operations without the constraints of a connection limit. Kapuli Business Park enjoys electric power supplies of first-rate dependability. Supplier: Water company Nivos Vesi Oy. District cooling, customized district cooling to the district heating on the site. Excess heat from cooling is transmitted for heating houses in Mäntsälä. Any excess heat from operations such as cooling may be transmitted for further use. Our proposal for your cooling solution is customized district-cooling. This would lower your investment cost as well as cost of energy. If you choose Mäntsälä to be the site for your data center we can build a facility that would produce both heat and cooling using heat pump technology. Re-use of excess heat generated by the Yandex datacenter. Ari Kurvi explains the excess heat collection mechanism in more detail at the CeBIT expo. 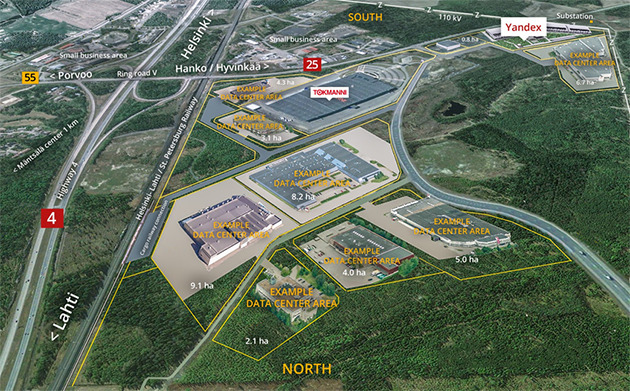 Kapuli Business Park enjoys fast, high capacity, assured data connections to the main Finnish Internet hub (FICIX). They all have fiber optic network in Mäntsälä and enough network capacity is available or can be built according to an order. Cinia will use either its own network or the networks of its partners to fulfill customer demands to reach required locations in Finland or in Europe. 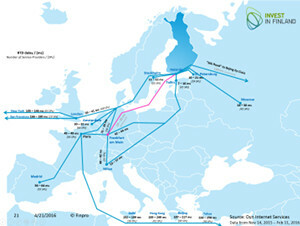 The Cinia C-Lion1 submarine data cable offers the shortest and fastest route to connect Central Europe with optimal data center locations in Northern Europe and business opportunities in Eastern Europe and Asia. Owned by the Municipality of Mäntsälä. Site area is 3 - 30 hectares, the buildable area is 2 – 20 hectares. Kapuli IIc: already leveled and ready to build. Soil condition: broken rocks. Kapuli III: will be leveled beforehand. Soil condition: broken rocks, moraine. Municipality of Mäntsälä owns approximately 100 hectares of land at the Kapuli Industrial Area. Approximately 38 hectares of the area has been zoned so far. The rest of the area will also be zoned as an industrial and logistics area in the next few years. In addition, there are plans for a road connecting Sälinkääntie road to Kehä V; this connection will go across the area. The lot to be sold (unseparated parcels of land) are owned by the municipality, and the construction of buildings for industrial and logistics purposes is allowed under the current city plan, as is the case already with the headquarters and logistics center of Tokmanni retail store chain (71 700 square meters) and a private investor's hall (4000 square meters). In practice, a water pipe and a sewer have already been constructed reaching the border of the lot, and there is also a natural gas pipeline nearby. 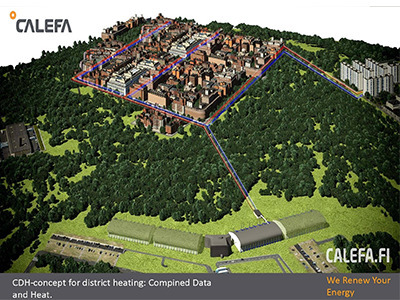 Moreover, district heating is available from the neighbors. At its natural state, the lot was forested land with bedrock outcrops, the soil was levelled in 2008-2009 to the present height using soil excavated from the area. Zoning and readiness for construction: Detailed city planning is in progress. The employer has a statutory obligation to take out accident and pension insurance for the employees; the employees are also provided with group life assurance and unemployment insurance in connection with the statutory accident insurance. The employer must arrange for statutory occupational health care. The employer is responsible for paying any withheld taxes and social security contributions to the tax authorities, and for submitting annual notifications to the tax authorities, and the pension and accident insurance companies, with information on the wages and salaries paid to employees. Regular working hours are usually at most 8 daily hours and 40 weekly hours. 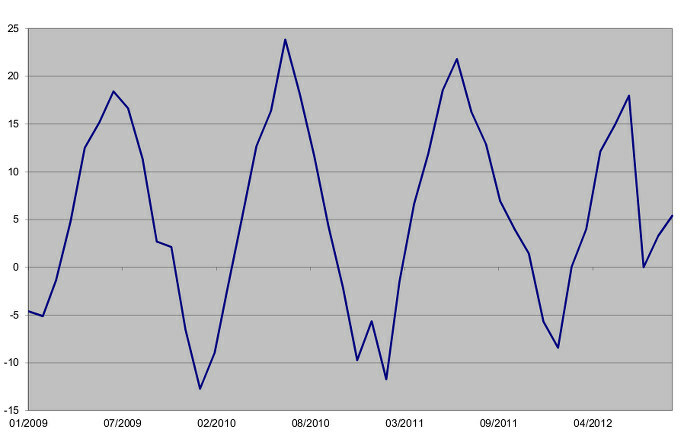 In a two week period the working hours are not more than 80 hours and in a three week period 120 hours. The weekly hours may also be arranged in longer periods during which the average weekly hours do not exceed 40 hours. Working hours may be arranged by law or collective agreements alternatively, for example in two or three week periods. An employee has a right to receive pay also for the time he/she is on annual holiday. Normally holiday leave accumulates 2 days (when employment has lasted less than 1 year) or 2 1/2 days for each holiday credit month. Normal wages are paid for the time an employee is on holiday. According to the law, an employee who is unable to work due to an illness or an accident is entitled to paid sick leave. Wages are paid for the day when the illness started and for the working days. If the employment relationship at the start of the disability has lasted for at least one month, the employee will be paid full wages for the said period. If the employment relationship has lasted for a period shorter than one month, half of the wages will be paid for the same period. Parental leave lasts 158 working days taken during pregnancy or in the period following birth. It is extended by 60 working days per child in the case of multiple births. During the parental leave, Kela (The Social Insurance Institution of Finland) pays parental allowance. Both parents can take the parental leave in up to two separate periods of at least 12 working days each. States that have adopted strict legislation on data protection generally tend to be more favorable to the placement of datacenters than states without or lacking sufficient legal framework of data sovereignty. The legislative environment of Finland is quite different even from the other Nordic countries. In Finland the right of privacy of any communication is a basic right that is inviolable and there is a strong legal protection over governmental surveillance of digital information. The favorable legislation to store and handle information has led many data center operators to establish business in Finland. The Government of Finland still intends to hold on firmly to this leading position in the world of digitalization and framework necessary for growth of this digital industry will be sustained also in the future. Experience what datacenter needs (Yandex 2013). Locations near capital city Helsinki and airport. With a population of over 20,000, Mäntsälä is a thriving municipality in the Helsinki Metropolitan Area. Mäntsälä is located at the junction of highway no. 4 and the Kehä V Helsinki ring road. In other words, it is the crossroads of the road from Hanko to Porvoo, just a VT40-kilometer drive from the Finnish capital. Mäntsälä is only 40 minutes from Helsinki by Z-train and 20 minutes from Lahti. The population is young, and many families with young children have made their home here. A wide range of services and leisure activities, beautiful countryside and excellent transport links attract new residents. What more could you ask? The search engine company Yandex selected Mäntsälä most of all for its excellent benefits in terms of location, secure energy supply and overall energy economy. We have established contacts with construction companies, employment services, security companies etc. We provide you with information on how to set up and run a business in Finland, including rules and regulations, legal entities, employment matters, taxes and more. Help businesses looking for premises. 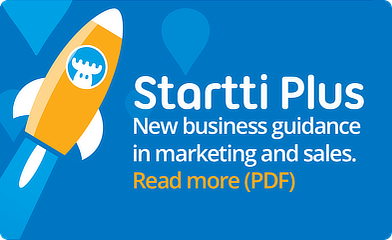 Our Tips and expert advice make it easier to run a business in Mäntsälä. We co-operate closely with ABB and Schneider Electrics. We also have good relations with different building companies in Finland. We can help you with recruiting and the permission questions. Yandex, Ball, Comforta and Tokmanni have all already invested in Mäntsälä. See why your company should too. Please state the name of the company you represent. It will be easier for us to contact you if we have your email address. Please give the phone number we can use to contact you.